You can get $5 free credit towards Video on Demand rentals from Amazon. When you do the above it will issue a Tweet from your Twitter account talking about the Amazon deal. The Blockbuster codes are only good for DVD rentals and not Blu-Ray. I found the Amazon deal on Slickdeals.net and the Blockbuster codes on Fatwallet. Our home does not have central air conditioning. This year for the first time we bought a window air conditioner. I was curious how many people actually have air conditioning. I got the data out of the American Housing Survey results from the previous years. I had to pull up individual years and copy the figures for each year. Note that I'm just looking at owner occupied homes so the data I show below does NOT include rentals. I could have gotten numbers for all housing or for rentals separately but to make it easier I just grabbed the number for owner occupied units. Here is a graph showing the % of owner-occupied homes with air conditioning either central AC or one or more window/room units. I'm a little surprised how many homes actually have air conditioning. I live in the Northwest where summers are pretty mild so its not as common out here. But its clear that over the years more and more homes have gotten air conditioning. Also the growth is all in central air conditioning systems. 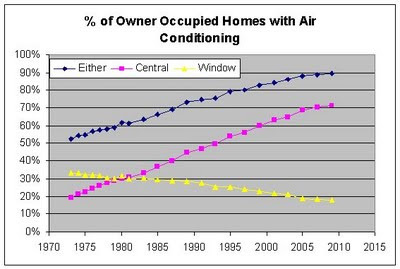 Over the past 4 decades the % of homes with window air conditioning units has steadily dropped while the % with central air has steadily grown. As you can see the percent of homes with AC is a lot lower in the West and Northeast. In the South 98% of homes have AC so its basically a given that a home will have some form of AC. Window units are a lot more common in the Northeast. FMF says Now's the Time for Givers to Get the Chase Freedom Card because Chase is giving 5% cash rebate back for gifts to charity from October to December. My dad recently rented a small 2 bedroom house. He keeps his rents very low compared to market so the renter got a very nice deal. I help my dad by posting his ads on Craigslist for him since he does not have a computer of his own. I know his rents are low but its been a while since he rented out this house so I checked online to see what comparable rents were. Rentometer and Zillow both give estimates for rents. Rentometer shows the rental median at $675 for that area for 2 bedroom units. They say that 20% of 2 bedroom rentals are below $584 and 20% are above $750. The listing for Zillow on the property address says that their rent estimate is $677. I checked Craigslist today and there were about 220 listings for 2 bedroom rentals. I then sorted based on units that allowed dogs. I further narrowed it down to units under $700. Out of those I then looked through the remaining units and found the single family houses. That single rental was listed for $645. $645, $750, $750 and $795. The median there is $750 and the average is $735. The Rentometer and Zillow estimates for the rents are $675 and $677. Those are about $75 lower or 10% less than the median rents I found by actually searching listings on Craigslist. I figure that Zillow and Rentometer are about 10% low based on my research in the market. If you used the Zillow and Rentometer figures then you'd be pricing your property 10% lower and losing 10% of your income. Now its quite possible that you could have found the opposite result and determined that comps in the rental market are actually higher than Rentometer or Zillow claim. That is also very good information to know. If you try and rent your property for 10-20% higher than market rates then you will have difficulty renting it. This could cause the unit to sit vacant while you search for a tenant. A vacant rental costs you money. You could easily spend over a month hunting for a tenant to pay extra and lose rent that time. Now its true that if you can find someone willing to pay more then the higher rent rate will make up for the rent lost during the vacancy. But its also quite likely that you'll never rent the unit at the higher rate and will lose rent for months only to have to drop your rent later to get tenants interested. Of course not everyone wants to live in a single family house nor do all renters care if you allow dogs. Many renters will be happy living outside of town if it means saving some money. But your rental is not priced to compare to the lowest common denominator. Your rental should be priced based on the features it has. There are people who want a single family home. There are renters who own dogs. Most people would probably prefer to live within easy driving distance of town rather than having a long commute. All of these things make your renter better than other properties which can't boast about these features. Bottom Line : You should not rely on websites like Rentometer or Zillow alone to set your rents. Spending more time to do some in depth market research on rental rates is well worth your time. 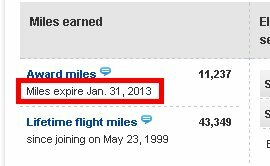 A few weeks ago I got a letter in the mail from United saying that my miles would expire within a few months. The mailer had an insert with a way to cash in some of my miles for magazine subscriptions. I didn't want any magazines and I didn't want my miles to go to waste either. I went to the United airlines site and looked through the options on redeeming miles but they didn't have anything I really wanted to use my miles for. I found and used two ways to keep my United miles from expiring and both were fairly easy and low cost. I've talked about ways to keep miles from expiring before. These two tricks are a little more specific and unique to United miles. Trick #1 ) Get a restaurant reservation. In the United Miles Plus shopping* system you can reserve a table at a restaurant and get 60 miles for doing so. They use the OpenTable reservation system to do the reservations. Of course I wouldn't go out to a fancy dinner only to keep my miles from expiring. It just happened that I had plans to have dinner with a friend at a restaurant that was in the reservation system. I would have eaten there anyway so making the reservation didn't cost me anything nor cause me to go spend money I wouldn't have. Trick #2 ) Buy something for $1. There are many shops on the United shopping site. Some of the shops have free shipping and cheap items. I arbitrarily chose Newegg.com since I'm familiar with them and I buy computer stuff there on occasion. I searched Newegg and I was able to find a roll of electric tape to buy with free shipping that was just 99¢. Buying that item for 99¢ got me 1 mile which extended the expiration of my miles. I don't really need electric tape so I'm kind of wasting a dollar on it but one dollar is worth spending to keep from losing 11,000 miles. I don't see electric tape there anymore but someone is selling many Magic the Gathering cards for 99¢ with free shipping. I was initially worried that only spending 99¢ wouldn't get me a mile, but they rounded it up and I got credit for one mile. One thing to watch out for is that the miles earned through the shopping site might take several weeks to hit your account. You need to do this well in advance of the expiration date for your miles to make sure it works. The United website says that it can take several weeks for the miles to be credited to your account. For me it took around 2-3 weeks to see the credits. It would be best to plan to use these tricks in advance. If you dine out at a restaurant in the OpenTable system with any regularity then simply remembering to use the United site to make your reservation 1-2 times a year would keep your miles from expiring. Or if you do online shopping at any of the stores in the United shopping site then you can use their site to start your online shopping and get miles that way. This way you can incorporate some free United miles in your normal activities and not cause any unnecessary or unplanned spending. * Unfortunately as I write this today and yesterday I have not been able to get to United Plus shopping website. It looks like the server is down. I assume that is just a temporary problem and hopefully its fixed by the time you read this. Right now Snapfish has a promotional deal to get 100 4x6 photo prints for just $1 using promocode WEDPRINT. The deal is good through Tuesday August 16th. You can also get 8% cash back, or 8¢, by using Ebates. I heard about this offer on Fatwallet. Last week Ebates ran a Daily double for 25% cash back at Symantec. When I saw the deal I was going to write up a quick post to tell people about the 25% cash back. Thats a pretty good cash back rate. 25% back is a lot.. right? It should be a good deal but its not a bargain if you end up paying a lot more in the end. Symantec Norton has virus software as well as other computer utilities. I would generally recommend for virus protection that you get one of the free programs out there. AVG is a good free virus scan. On the other hand Symantec has some other good software like Norton Ghost which is an industry standard backup utility. Symantec has Ghost 15.0 for $69.99. When I saw the deal I figured at the time that there might be someone who wants to buy something like Ghost and 25% should be a good discount. 25% cash back would be $17.49. That seemed like pretty nice savings. But then I remembered that I'd bought a copy of Ghost years ago for dirt cheap on the internet. At the time I think I bought a 1-2 year old version that worked fine for me but was considered obsolete. I figured I should price compare Ghost. Low and behold, you can buy Ghost 15 for $28.95 at Buy.com. Amazon has Norton Ghost 15 for $27.95. The price at Symantec after the 25% cash back discount is still about 88% higher than what Amazon has it for. On top of that the version of Ghost at Symantec is a digital download and the version you can get at Amazon is a physical CD. The download really should be cheaper than a CD since it costs much less to manufacture. Its not like Symantec raised their price and then gave you a discount. They didn't start at $30 then jack it up to $70 and then pretend like 25% off $70 is a good deal. What we're seeing here is a full retail sticker price at Symantec. Then they offer a 25% discount to their store. Thats not unreasonable. Some chose to stick to high suggested retail on their own store so they don't undercut the sales of their distributors. Other companies like Apple stick to flat prices everywhere so if you buy it from Apple or Bestbuy or Target you're going to pay the same price. I don't think there is anything really wrong with either way about doing it. But in this case it really is important to know if the manufacturer has a high retail price for their own store or if the prices on their store are competitive with the prices elsewhere. Of course there are other ways to save even more money. You could buy Ghost 15.0 used on Amazon market for $14.95. If Ghost 14.5 is good enough for you then you can get that used off Amazon market for $2.75. Looks like Ghost 14 had some problems with Windows 7 for several users so if you're running Win7 you may want to go with the latest revision. That doesn't really change the comparison of buying New via Symantec's own website versus buying new elsewhere. But I wanted to mention it cause its yet another way to save a lot of money. Bottom Line : Make sure you price compare before you jump at a large sale price.